The Newstates Constitution: Total Change from a Constitutional Republic to Constitutional Fascism | No Convention of States! A Balanced Budget Amendment is the WRONG solution to unauthorized spending by Congress! The Constitution isn't broken, the Electorate is! On May 30, 1984, a group called the Committee on the Constitutional System (CCS) held a Washington, D.C., news conference and released a summary of a meeting which had taken place the preceding September 9-10, 1983, at the Woodrow Wilson Center in Washington, D.C. This confirms that a powerful elite group is waiting in the wings to bring about a radical restructuring of our American Constitution. Allow or require the President to appoint members of Congress to some or all Cabinet positions. Increase the terms of U.S. House members from two to four years, with all elections held in Presidential years. Force the American people to cast a single vote for a package slate consisting of the President, Vice President, and the voter’s own House candidate. Change a large number of U.S. House seats from election by district to election “at large” in order to increase the possibility that the political party which wins the White House will also control the Congress, and that the “at large” members would be more likely to take a “nationwide view” of the issues. Devise a “more realistic, feasible” method of Presidential removal by an extraordinary majority in both Houses of Congress. Permit the President to dissolve Congress (when he thinks Congress is “intractable”) and call for new Congressional elections. Reduce the two-thirds requirement for Senate ratification of treaties to a simple majority only. 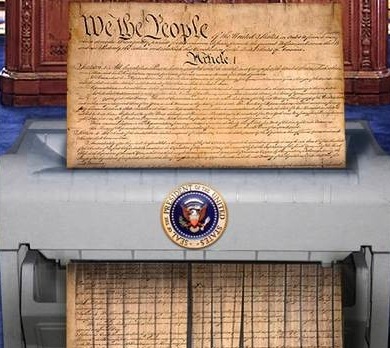 Eliminate the 22nd Amendment which limits presidents to two terms. Eliminate the Electoral College and allocate each state’s electoral vote directly. If no candidate receives a majority vote in the Electoral College, then elect the President and Vice President at a joint session of both Houses of Congress, with each member having one vote (instead of the present system of one vote per state). Eliminate the requirement that appropriation bills must originate in the U.S. House. Overturn the Buckley v. Valeo Supreme Court decision which upheld the right of individuals to contribute to political campaigns. Force the taxpayers to finance Congressional election campaigns so that political expenditures by the candidate and by PACS can be limited or prohibited. Reduce the cost of Presidential and Congressional elections by holding them at irregular intervals so that the date would not be known very far in advance. Give the Federal Government — instead of the state governments — the power to regulate and supervise cities. Does this sound similar to recent proposals, petition drives referendums and proposed legislation introduced in Ariozona and other states in 2012-2013? Now we know where these socialist ideas originate! and who is behind these socialist ideas to remove the God-provided rights of U.S. Citizens? The Ford Foundation, whose privately admitted goal is to merge these United States with the Soviet Union, and George Soros, whose publically admitted goal is to create an ‘Open Society’! ‘Runaway’ conventions are the order of the day! “Convention of States” had problems back in 1995! Speaking the Language of Liberty! "Stop the National Popular Vote"